You may notice that in one of the screenshots below that the game is asking me to Pre Order it. I own the game via Game Pass and this message never once went away during my entire playthrough of the title. "My Quiver is out of Answers.."
Blending Left 4 Dead with the Warhammer fantasy genre almost seems like a match made in heaven. The original Vermintide shamelessly borrowed from the Left 4 Dead formula while keeping the action consistently flowing and offering up a diverse cast that would banter back and forth as we chopped up the hundreds of enemies that came our way. The fantasy element was another feather in the titles cap and one that helped the game find a fairly large audience. Now, some three years later, we have Vermintide 2, a follow-up that does very little to change up what we have played before but still comes across as an enjoyable co-op experience. While I'll attempt to refrain myself from listing all the Left 4 Dead comparisons, this is a game that borrows from several aspects of Valve's co-op masterpiece and the similarities are pretty much everywhere. I'll do my best to judge the game on its own merits, but please keep in mind that many of these comparisons are valid and can also be used to explain how certain things work in Vermintide 2 for those familiar with the Left 4 Dead series and have been craving a third in the franchise. Vermintide 2 takes place shortly after the events of the first game, where our heroes had been captured by Grey Seer Rasknitt. Because of this victory, Rasknitt then conquered the city of Ubersreik and began the construction of a giant portal called the Skittergate. During a test of the gate, it malfunctions and causes considerable destruction to the nearby prison cells, freeing one of our heroes, Markus Kruber. During his escape, he frees each of the other characters, and they escape to plot revenge against Rasknitt and his followers. Kruber and the others retreat back to an abandoned keep, ready to head out on a moments notice through a tale of revenge. The story is mostly told during the loading screens into each level as well as through brief discussion among our heroes. For as much as the game tries to inform you of the narrative, the story seems to take a backseat to the action. This type of narrative delivery is commonplace for co-op shooters as this also seems to be the case with the recently released Earthfall and of course, the Left 4 for Dead series. This isn't to say the story is bad in any real way, it just could have benefitted from being far more pronounced. While it is disappointing not to see any new faces round out the cast of returning heroes, Vermintide 2 does attempt to play with what is available by offering up 2 additional classes to each hero. Each of these "careers" have different skills and passive abilities that can change up not just the team dynamic, but how you as a player will survive. Markus Kruber, the mercenary, has the ability to grant temporary health to his team with his morale boost skill. Switching to the Huntsman career allows him to cloak for several seconds at a time and the Foot Knight career changes it up even further by gifting him a valiant charge attack as well as a passive skill that grants him damage protection and increased stamina. By swapping out these abilities, your team may have to additionally change up their tactics if they came to rely on certain abilities working in tandem. At the Recruit difficulty you can manage to remain somewhat independent from your peers, but at the higher stages of difficulty, everyone needs to work together to survive. Your first career is unlocked when you reach level 7 and then another at level 12 for each of the main cast. I unlocked Kerillian's full assortment of careers shortly after I had completed the main campaign and then jumped right back in to fly through a few missions to finish off her set and to see what each of these new career's could do. While both of her additional classes are visually cool and offer some interesting skills like turning invisible or dashing through your foes, they still didn't feel as functional as her starting class. Much like in a character based game like Overwatch, you may find that certain characters work with the type of playstyle that you yourself tend to gravitate towards. Kerillian, being the rogue of the group, is the playstyle I tend to favor, so it was only natural that the majority of my time spent in the game was through her Waystalker career. The remaining cast, as I've mentioned, is unchanged from the previous title. You still have the Dwarven Ranger; Bardin Goreksson, the Witch Hunter Captain: Victor Saltzpyre, and the Battle Wizard: Sienna Fuegonasus. If you are the type of player to max out each character and career as well, then you're going to have your work cut out for you. Among the skills and passive abilities that you'll unlock with each character, you can also customize within each class via talents. 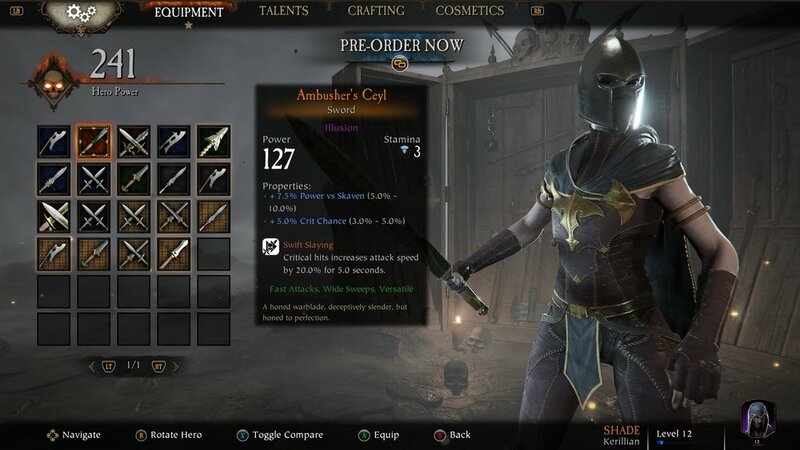 Every 5 levels will allow you to choose from three distinct talents across all 3 careers, making very unique builds in the process. These range from granting additional stamina, increasing your attack speed, enhancing your dodge roll, or gaining health upon a bosses death. There are a considerable amount of talents to unlock and best of all, swapping careers does not impact your level with that character, thus negating the need to re-level them all over again when you swap to a fresh new career. As you complete each of the 13 available levels, you will be rewarded with loot chests that contain a variety of weapons, charms, and the occasional armor skin. The latter could very well be considered a very rare occurrence as during my entire time with the game, I earned two items for my elven archer. As you track down each hidden collectible or complete additional challenges within each level, the rarity of the chest you are offered increases. Apart from those level rewards, there are a host of independent challenges that you can complete that will also shower you with rewards. These are as simple as defeating a certain amount of enemies, having enemies die a certain way, defeating certain bosses, or just simply leveling up and unlocking new careers. Again, for those who like to 100% every single challenge with every single character, there is a lot here to work towards. With a metric ton of loot from the variety of rewards offered, you will often be left with outdated and weaker gear that is going to just sit there. As there is no shop to sell your hand-me-downs, you can instead break all those items down into base ingredients and craft yourself better items. Items that have special abilities attached to them can have those abilities transferred to other items as well as upgrading existing items to benefit from additional skills added to them. 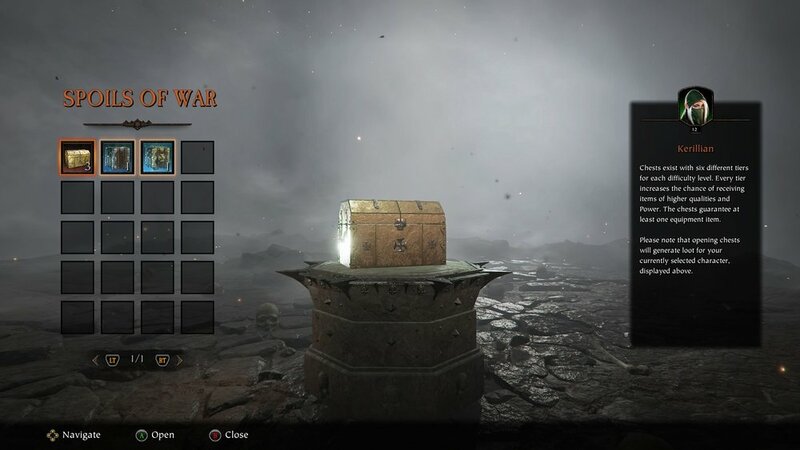 What I found really rewarding about Vermintide 2 is that I felt as if I was constantly working towards better gear regardless of the RNG of the loot boxes. Combat itself is fast, fluid and immensely enjoyable. Hacking and slashing is instantly satisfying as the ranged weapons, such as the bow, can decimate hordes of creatures in mere seconds. Each hero can equip two weapons within a certain category, so no, you cannot equip to sets of bows to the archer no matter how hard you try. The structure of each environment adheres to the same format from the previous release as well as from you-know-what. While the landscape may change from a snow-topped mountain, abandoned town squares, or widespread forests, the linear pathing is meant to push you along from encounter to encounter with the occasional objective to complete. Most levels will end with an event where you must band together to survive and then escape. The comparisons to Left 4 Dead continue as you'll have to contend with specialized enemies that can pounce on you from the shadows like the Hunter, or a behemoth of a health bar called the Tank. Now, in Vermintide 2 these are called by different names, but the concepts built around them are identical. One aspect of the level design to keep in mind is that there are jumping off points that prevent backtracking, so ensure that you move ahead as a group or it's possible to get jumped by one of these foes and be unable to receive assistance. Thankfully, death is a bit harder to stick as you'll just appear in need of a rescue later on in the level. That being said, health packs and potions are plentiful at lower difficulties and can turn a losing battle around in just a few seconds. The levels themselves are rich with detail and just look incredible. There are small variations of forests and jungles that may share in some small aspects, but each environment can often feel unique and engaging due to the bottlenecking or open fields from which to do battle. While some levels may start off in areas that feel familiar, they will quickly change and take you to some wondrous locales. There are moments where you will get lost or lose your bearings, but these are easily solved when jumping back into each level again and again. 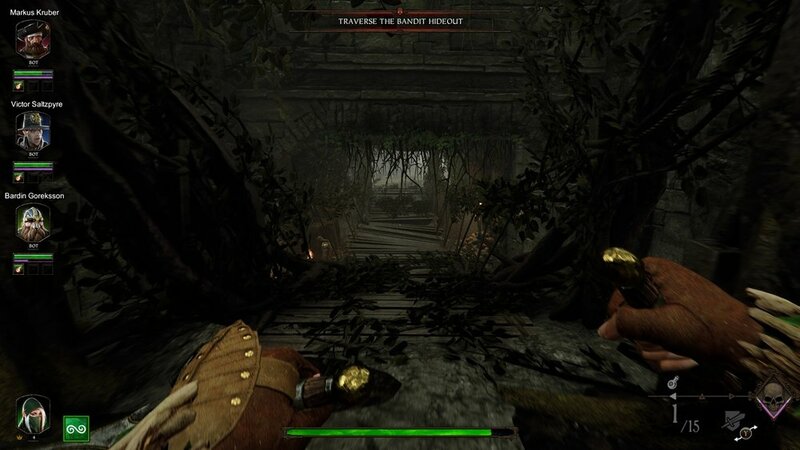 Vermintide 2, much like Left 4 Dead, is a game built around repetition. Another visual aspect to the game that has seen a vast improvement since the previous title is in the HUD and menu tabs. They are more intuitive and far easier to navigate. Vermintide 2 offers the ability to either play solo with a trio of AI companions or online with a selection of random players or friends. Now, if you start an online game without anyone present in your lobby, those AI companions will keep you company until other players join up. The AI isn't terribly great and while they will do their best to swing and kill to their heart's content, I find that when you are downed and waiting to be rescued that they will often get themselves killed trying to save you. The one best aspect about the AI, at least during my time with the game, is that they will follow you closely like a very loyal puppy. While playing with friends is ideally the best option, the matchmaking can leave a lot to be desired. When choosing your character and looking for a lobby to join, you may be prompted to change your character due to the fact that duplicates are not allowed. While this may be due to the vocal work that comes with each grouping of characters, it is more than likely a result of balancing. While you can pick another character to proceed with, I usually would just reattempt matchmaking or just make my own lobby. This is mostly frustrating should you tend to main a specific character like myself and I would have preferred a filter via the matchmaking to search for lobbies where my character was free to use. Left 4 Dead left quite the impression on the gaming industry some many years ago and with Valve unlikely to revisit that franchise any time soon, it is up to games like this to continue in its stead. Now, I talk a lot about how this game apes Left 4 Dead in a variety of different ways, but it also does a lot to distance itself from the other copycats. The fantasy setting, the loot and progression system's alone are fresh ideas to this formula and serve the game well. If you are interested in Vermintide 2 as a solo player expecting a riveting story set in this fantastical world, you may not get what you want out of it, but if you are looking for an action-heavy co-op adventure game for you and a few of your close friends, then you can't do much better. Best of all, Vermintide 2 is freely available to those with Xbox Game Pass, so it is certainly worth it to give this title a closer look. ...and for those of you playing the Left 4 Dead drinking game, that's technically 16 shots. Drink up. 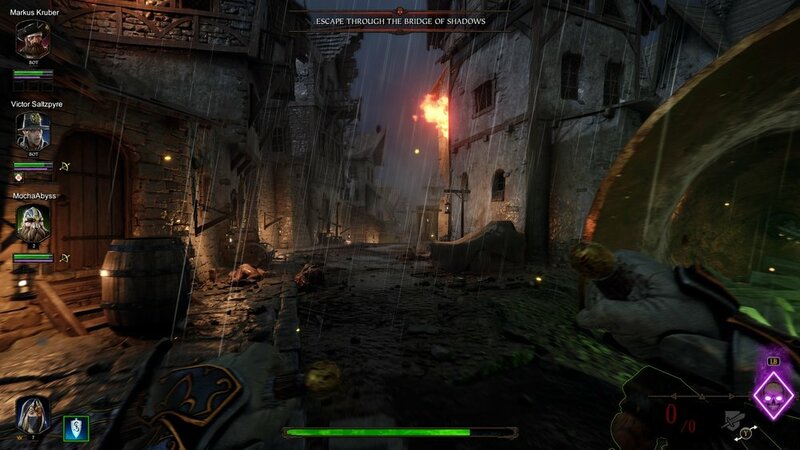 Warhammer : Vermintide 2 was downloaded by the reviewer through Xbox Game Pass.